Antiques specialist Virginia Blythe of Gable & Co. Auctioneers is working late one night when she hears mournful wailing. Following the sound to its source, she gasps in astonishment: a breathtakingly beautiful flapper who looks like a refugee from an F. Scott Fitzgerald novel is lingering in the shadows of the company’s basement. Later the disconsolate young woman returns to offer Virginia her diary, written in 1928. 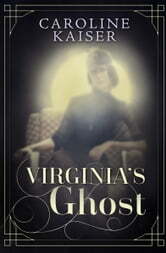 It reveals she’s the ghost of wealthy Toronto socialite Constance Pendleton. What is Constance trying to tell her? Intrigued, Virginia curls up with the diary and begins dipping her toes into the elegant opulence of Constance’s Jazz Age world. But suddenly things go terribly awry at Gable & Co. Just as Virginia’s preparing for a blockbuster auction, some valuable porcelain mysteriously goes missing and her job is on the line. The worst, however, is yet to come. A shocking murder spins the eccentric world of the auction house into chaos. Struggling to make sense of it all, Virginia turns increasingly to the secrets of the diary. Virginia’s Ghost is a tale of ghastly crime, euphoric love, and devastating betrayal in which two women transcend time to affect each other’s lives in startling ways. as the author claimed, this was a nice cozy mystery. I quickly became lost in it’s web. Well written with an interesting plot.